Are You Interested In How Whole Person Care Can Help Us With Pain And Dying? Do You Work With Others In Pain And Find Yourself Burned Out? Want To Learn How Diana And Yael Practice Self Care As Therapists? Join Us For And Interview With Palliative Care Physician Dr. Michael Kearney! In this episode, Diana interviews Dr. Michael Kearney, a palliative care physician who takes an interpersonal, integrative approach to healing. Dr. Kearney shares with us how he has had to learn to "breathe underwater" and allow pain to move through him, and discusses his new book: The Nest in the Stream. Michael Kearney MD trained at St Christopher’s Hospice in London with Dame Cicely Saunders, pioneer of the modern hospice movement. He later returned to his Ireland as medical director at Our Lady’s Hospice in Dublin. In the early 2000’s he moved to North America, and now lives and works in Santa Barbara, California. Throughout his career, Michael has been interested in whole person care and approaches that combine medical treatment with the innate healing potential of body, soul, and spirit. He draws on depth psychology, mythology, Buddhist philosophy, indigenous wisdom and Earth-based spirituality. Michael has published three books, Mortally Wounded: Stories of Soul Pain, Death, and Healing, and, A Place of Healing: Working with Nature and Soul at the End of Life, as well as many articles and chapters. 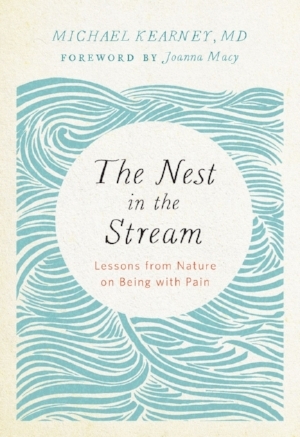 His most recent book, The Nest in the Stream: Lessons from Nature on Being with Pain, offers a way of being with pain and suffering that is infused with mindfulness, nature connection, openness, and compassion. Michael is married to psychologist, meditation teacher, and author Radhule Weininger, Ph.D. They teach and write together and share six adult children between them.